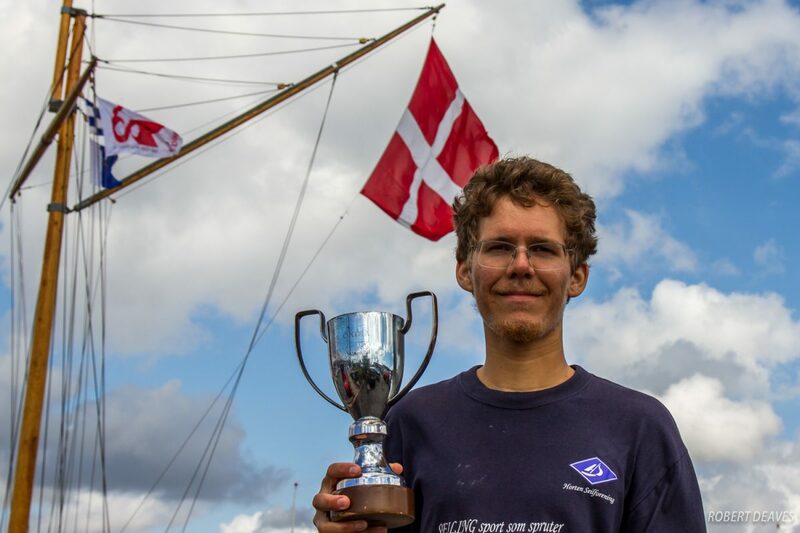 Lars Johan Brodtkorb made history today by becoming the first Norwegian ever to win a major OK Dinghy Championship, after the final day of the 2017 OK Dinghy European Championship in Faaborg, Denmark was cancelled because of strong winds. Charlie Cumbley from Britain takes the silver and the defending champion, Bo Petersen, takes the bronze. The forecast strong winds arriving during the night, along with even more rain. Many sailors began packing on waking, but the stalwarts and hardy sailors braved the elements in the dinghy park and hoped to sail. However by 12.00 the conditions had not improved and the forecast was not promising, so the race officer abandoned all further racing. Cumbley adds another silver medal to his bronze and silver at the World Championship, but the gold continues to elude him. While the weather here has been the dominant factor, next year the event moves to the Mediterranean at Bandol on the Côte d’Azur, where the hope is for less Danish weather, but the same great hospitality and competitive racing.